The intricate detail in this cobalt wedding band is breathtaking. 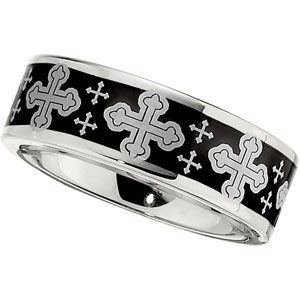 Can be used as a Celtic ring design to match with another set or simply worn alone. Because cobalt rings are bright white, the contrast is excellent. As you can see, there are 2 smaller crosses between each main one. For those seeking a unique men's wedding band, this is it. This product is stocked from sizes 8-14 including half sizes, and must be returned within one week of order for replacement or size exchange. Ships within 24 hours.